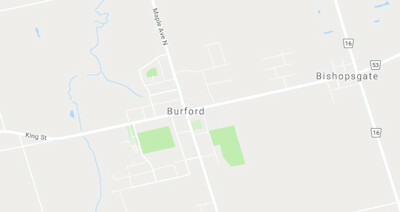 Burford Ontario is a small community of about 1,600 people in Brant County. It is just 8 km west of Brantford and 70 km east of London Ontario on Highway 53. It is also about 100 km southwest of Toronto. Houses for sale in Burford Ontario place buyers about midway between London and Hamilton Ontario, about an hour's drive in either direction. Many here work in nearby Brantford. Homes for sale in Burford Ontario vary widely in age, style, and prices. Older homes near the center of this small community are laid out in a grid, traditional neighborhood setting with prices that generally range from $200,000 to $600,000. Newer construction, especially just to the northwest, is being offered at significantly higher prices topping $1 million. For those seeking executive, upscale Burford Ontario real estate, the area also includes some multi-million dollar properties that may be available. Burford Ontario Real Estate is an excellent choice for those working in Brantford Ontario or willing to make the commute to Hamilton or London Ontario. It is a small, quaint community with a “downtown' that hosts several smaller businesses and restaurants. There are two large parks near the center of Burford, Lions Centennial Park and Burford Optimist Park that serve as focal points for recreational and community events. Dining and entertainment options increase with visits to nearby Brantford. The Burford Fall Fair traces its history to 1858. Burford Golf Links is the community golf course and the town is also home to Burford Arena, home of the local hockey team. Get in touch with Team Forster today to learn more about the Burford Ontario real estate market and to request a showing now! Give us a call or text 519-851-2844 to speak to a Burford real estate specialist today.